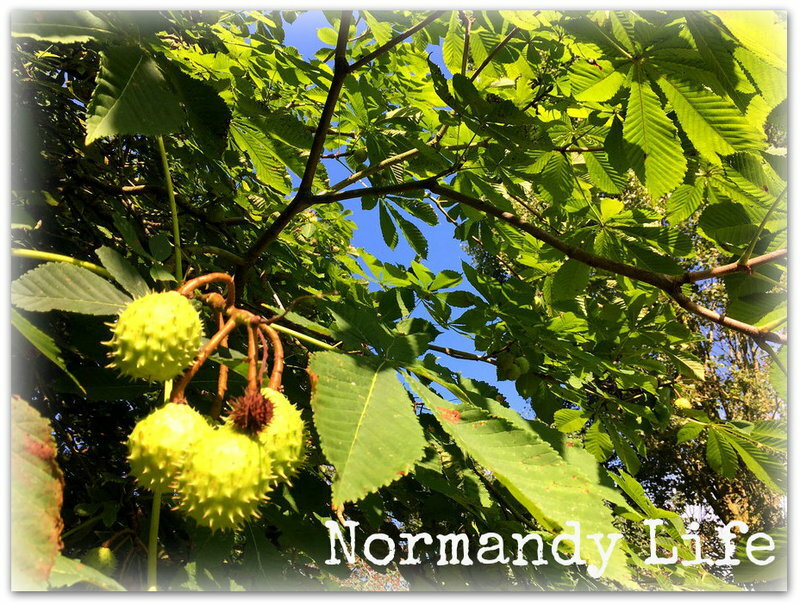 Normandy Life: Mosaic Monday # 18. Seasonal preparations. Mosaic Monday # 18. Seasonal preparations. Eating home made mince pies is a British tradition that the SP and I have kept up ever since we left Merrie Olde England over 30 years ago. Whether we celebrated in the snowy wonderland of Bavaria or a rural backwater in Normandy there have always been mince pies to eat at Christmas. Over the years I have tried Delia's, the Hairy Bikers and Jamie Oliver's recipes to name just three but the basic list of ingredients - dried fruits (raisins, sultanas & currants), suet, sugar, candied peel, mixed spices and brandy always remains the same. 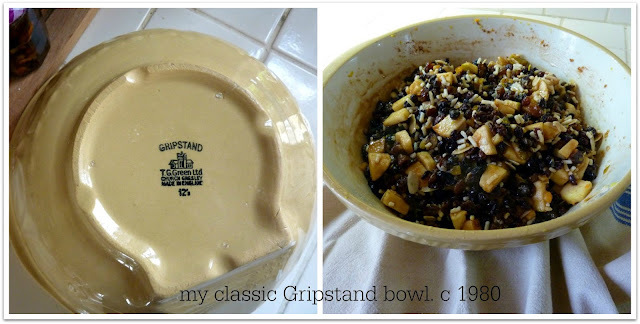 One other thing that stays the same is the bowl that I mix my ingredients in, a classic cream coloured stone ware T G Green "Gripstand" bowl. With Christmas fast approaching I decided that it was time to start preparing this years batch, so on Saturday afternoon I gathered all the ingredients together ready for the first stage. After weighing, measuring and mixing everything, except the brandy, together I covered the bowl and left it to stand overnight on the kitchen windowsill. On Sunday morning I added 2 tablespoons of Cognac and at the SP's suggestion 2 tablespoons of Cointreau to enhance the zest and juice of the oranges and lemons before placing the bowl in a low oven (120C) for about 3 hours. After the mince meat had cooled a little I spooned it into clean warm jars before storing them in the pantry. As the mixture slowly matures the flavours will continue to deepen until I'm ready to make the pies. If the sweet and spicy aroma pervading the kitchen yesterday is anything to go by I'm guessing there'll be a request for some pies by next weekend at the latest! Oh i am so glad that I visited you just after we had dinner. But this post still made me hungry! And it seems I can almost smell that spicy kiitchen. Thank you for hosting and for your kind comment on my last post -- my hands are healing. i still cana't type very well (good excuse perhaps). Your kitchen looks so cosy! It is great to keep up the traditions - we have here our own ones too! Happy pre-Christmas time Maggie! Maggie I've tasted mince meat and really like it, but I've never tried to make it myself. It's nice that you have kept the tradition of making your own for so many years. A wonderful tradition to keep over the years. My grandmother always made mincemeat, in fact I have a rather large earthenware urn type thing that I hear was where she stored the mincemeat, or let it age. It's not even breakfast time as I write, but this is making me hungry. I love mincemeat pie. My grandma made hers with all of the above plus beef. It was amazing. Last year I made a traditional British Christmas Cake, oh so delicious, but unfortunately i was the only one very fond of it. These are wonderful traditions. I bet your house smells wonderful. OH I do loooove mincemeat! I used to make it with venison, but now with our children gone, I'm the only one here who likes it, and I certainly don't need to eat entire pies by myself. I might have to reconsider that, as I sure do miss it. It brings back many wonderful memories. Mouth-watering! Thanks for the tips. Might try someday. How wonderful to keep this tradition going. Mincemeat is not something that we grew up with or are familiar with. I can imagine the aroma is something nice to start the senses going in anticipation of the season of Advent culminating with Christmas day. I think the added Cointreau should be nice. Have a good week! We love mince pies and I can almost smell the wonderful aroma in your kitchen. The ones the sell here in Canada don't rival those sold in Britain. 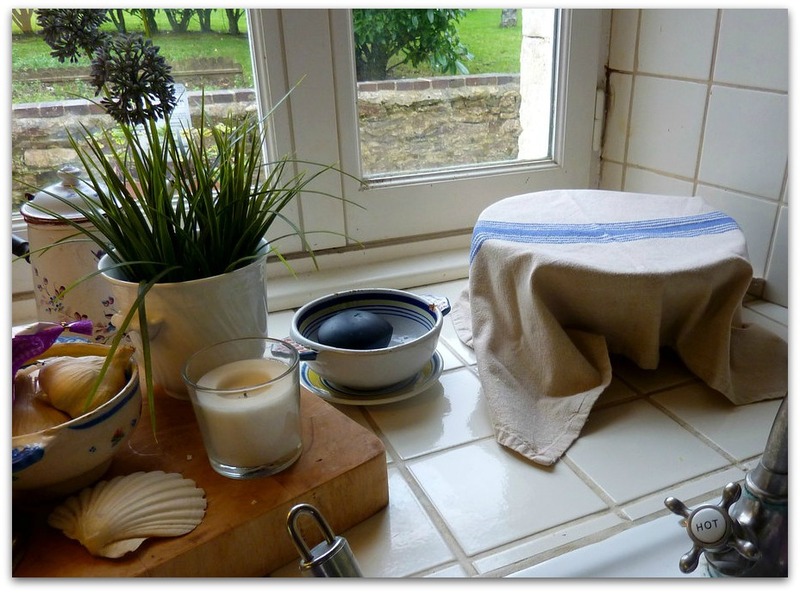 Hi Maggie, thank you for Mosaic Monday 18 and your photos from your kitchen and your wonderful mincemeat. Have a lovely week. Yummy Mincemeat pies. The aroma is wafting over this way. I guess I'll have to make some also. I have never had mincemeat pie! But it sounds delicious and oh, I can practically smell all the wonderful fragrances from here across the pond! I've never had mince pies. Hello Maggie. Mince pies (we call them tarts) are a bit of a tradition here in Canada, too, although I think fewer and fewer people enjoy them. I don't, but my husband does. 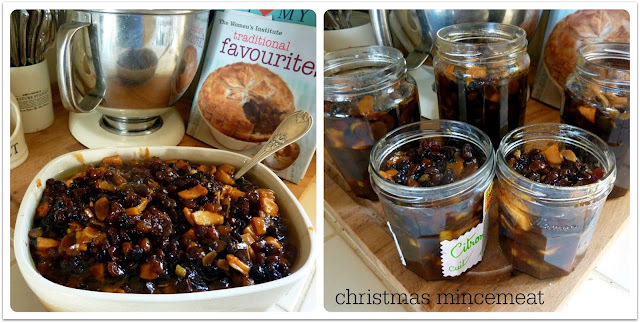 I do like the scent of mincemeat, but I've never made it - just purchase a jar and spoon it into the tart shells. I joined MM quite late this week. Thank you for hosting. I love fruit mince pies but I've been disappointed with my results the last few years, probably because I've bought a commercial variety of mince. I think I need to start making my own, and your blog post has probably inspired me to do just that. Happy holiday baking. I have never made mince pie, but it was one of my favorites as a child. My mother made mince meat pies with venison. I haven't had the pie since I was a child. Yours will be a wonderful addition to your Christmas dinner. Wow, Maggie! You are an expert! I'd like to try one of your mince pies!